A showreel from a team that are really passionate about not just slomo, but trying to film the moments of life, making reality into a picture, describing visually that fleeting moment of bliss or horror. Slomo is fun, but it’s also about telling a story. And it’s not about cameras. UPDATE: Writing >2GB files on SSDs >240GB with the Seagate GoFlex Thunderbolt Adaptor can cause the drive to unexpectedly dismount from your computer with an error (-50). Read the full story and the solution by Wolfgang Bauer. Following on from my USB3 testing, I’ve finally received an interesting box – the Seagate GoFlex Thunderbolt Adaptor, now in stock for about £100. The cool trick is that you can connect any ‘bare’ Solid State Drive (SSD) to it, and the price of SSDs is coming down quickly. A 256GB SSD can be had for under £140. Of course then you have to add your £40 cable, but assuming we can use one adaptor and cable for all your SSDs, finally we have a solution for Thunderbolt SSD for editing (and archiving/Backing up to USB3). The downside is that you’ll probably want to keep the bare drive in the adaptor with some elastic bands or something – very high tech. Because it’s freaking fast. That’s why. Editing with Final Cut Pro 10 on this drive is the sort of experience we assumed it would be. No spinny beachballs of death, no stuttering, just ‘slick demo’ performance. We’re talking 5x the speed of FW800 write, 8x the speed of FW800 read. And then there’s file access times. With the same cable and adaptor, you can purchase additional SSDs for £140, and pretty soon we’ll see half a terabyte for under £200. For my little industry niche, that means one SSD per edit for the duration of that edit, then archived off to hard drives so the SSD can be recycled, but happy to have maybe even a dozen of them – which I couldn’t afford with the current clutch of Thunderbolt/SSD combinations. As I edit on site a lot, this can mean little gotchas like power suddenly dipping or going off entirely. Not talking third world style, just leaving a render in your hotel room and Housekeeping thoughtfully remove your room key that you taped into the slot to keep the power on. Or that moment after a big event where you’re backing up, and the 3-phase power you’ve been living on gets pulled for the de-rig. Which is why I’m so passionate about bus-powered drives that can work with a laptop editing computer. And then there’s the scary ‘let’s edit this in the car’ or ‘let’s log rushes on the plane’ – with spinning disks? No. Ah – how about SSD? Fine. I’ll be archiving ‘media managed’ videos to thumb drives next. It makes hard disks feel as old fashioned as tape. USB3 for Macs – Thunderbolt killer or simple step up? I’m a dyed in wool Mac User, so for me USB3 hardly came into view. I do remember watching a USB3 demo on a Mac where it displayed sub- FW800 performance – and decided to leave it at that. However, the continuing need to pass on my video work to PC users for archive, and the achingly slow performance of USB2, forced me to at least check it out for myself. At least it would give me something to do whilst waiting for sensibly priced Thunderbolt storage and cables. After all, the Mac world is still full of USB2 devices: cheap, slow hard drives and computationally undemanding stuff like mice and keyboards. Little USB sticks for storage to perpetuate ‘sneakernet’ file sharing. There is of course, that funny USB3 sticker on most PC drives that claims high performance and that may be good enough for our PC using brethren, but we’re Mac users – why not sidestep the USB3 ‘upgrade’ for the super fast world of Thunderbolt? That’s the mindset that Apple appears to want us to hold. But the new set of Ivy Bridge equipped Macs will get, courtesy of their new chip set, USB3 functionality. Will Apple connect this functionality into the OS? Or will they find a way to block it? Should we care? The world of PCs has been using USB3 for quite a while, scratching their heads over the Mac user’s obsession with FireWire and the ‘Unicorn poop’ status of Thunderbolt. Why are Mac users so precious about FireWire? USB3 blows it out of the water! 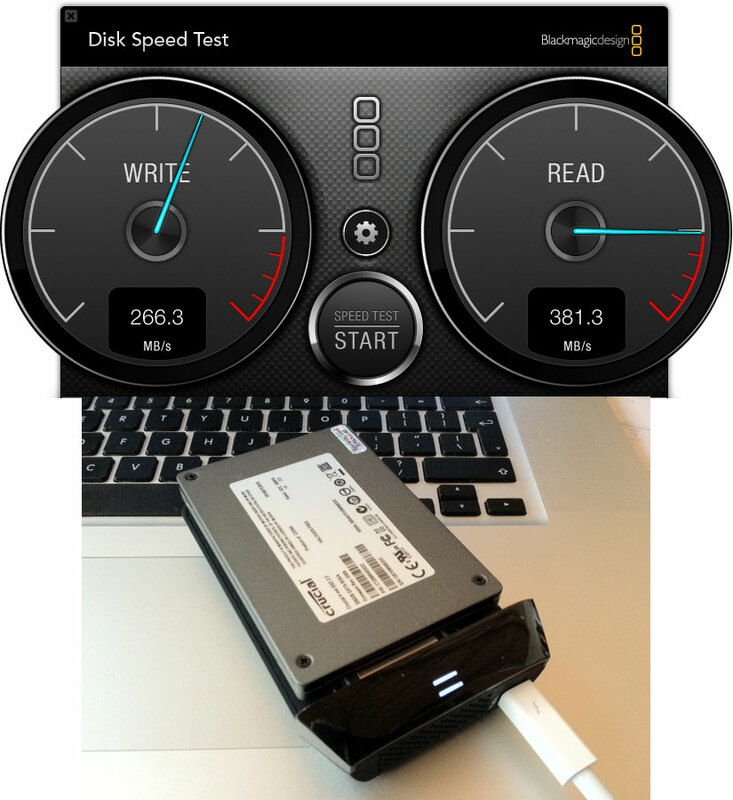 They want Thunderbolt speeds – for what? And connect them with $50 cables? If the devices are blessed with pass-thru ports – which so many aren’t? (see sidebar below) USB3 has hubs! I purchased the CalDigit USB3 card which fits into the ExpressCard slot of my MacBook Pro 17” – the choice of CalDigit is significant, as it’s the only one that’s touted to work with pretty much any USB3 drive – other manufacturers of USB3 cards tend to only work with their own drives and thus missing the meaning of the U in USB. I’m used to working on FW800 drives, and so intended to use cheaper USB3 bus powered disks for backup and for handing over to clients, who could use them on their PCs. However, when used as the main working drive with a disk intensive application like Final Cut Pro, it was obvious that the USB3 drive was a lot faster. FCPX was running far better on USB3 than on FW800. Of course, what’s missing from this test is the ultimate: SSD in Thunderbolt drive, but these are still eyewateringly expensive. The £75 Western Digital drives represent the kind of value we’ve been used to with spinning disks, and I can affirm that they work very well with Final Cut Pro 10 – the WDs on USB3 have been my drive of choice for onsite editing, with the added advantage that they’re cheap and compatable and can be passed over to the client without too many caveats (having archived to other drives). Is USB3 better than Thunderbolt? No – it’s a different beastie. Should we give up on Thunderbolt for USB3? Of course not. Should Apple now accept USB3 as a non-competitve alternative for non-specialist media use? Of course. In the days of Steve Jobs, I’d fear that USB3 would be disabled in the new Macs in a fit of pique. The adoption of USB3 in the new Macs would demonstrate a more universal approach from Tim Cook et al. At least CalDigit offer the option to MacBook Pro 17” users – and for everyone else, there is, of course, the Thunderbolt adaptor for Express Cards. Oh the irony. Side bar: Thunderbolt devices can be powered via the cable from the host, but only one device per port. So, Thunderbolt powered devices do not have a passthrough port. Powered devices can have passthrough ports, but these are a rarity as most manufacturers seem to feel a single Thunderbolt port is enough. However, when you’re paying top dollar for a new technology, the idea that a device will only work as the single device on the chain is frankly anathema. Video ingest device with no pass through to a storage device? Storage device with no pass through to a display device? No wonder Thunderbolt is taking its time to get accepted when device manufacturers assume their product will exist in its own lonesome prefecture. This could also be another report of ‘the bleeding obvious’ but I thought this was worth sharing. You’re a videographer. You go out and shoot things. Ideally, you’d have your trusty Sound Guy beside you, but most of the time you’re on your lonesome. You’ve got good mics, you plug them into your camera. You get good level and you’re up on mic placement. An input’s an input, right? We know that microphones generate very small signals compared to mixers and other devices chucking out ‘line’ level. To hear what microphones hear, we need to amplify them to the same line level before they get processed as ‘audio’ for the camera and bundled into the recorded video – whether that be on tape, as a file or whatever. The bit that amplifies the microphone input is known as a Mic-Pre – a Microphone Pre-amplifier, and it’s not exactly talked about on pro cameras. It’s not normally an issue because your trusty Sound Guy takes the microphones, places them expertly, gets their signals into the mixer, balances them all and feeds the result to you as a Line level audio signal. All 16 bits of data per sample, at a perfectly adequate 48 KHz, get written with your data and it sounds great. So Mr Videographer goes out and plugs his mics straight into the camera and, well, it’s good level. It sounds okay. It sounds fine. It will do. But if you’ve ever had sound from a good Sound Guy, you’ll know it has depth and sparkle and range and all sorts of things. My audio never had that. It was dull – competent, but dull. The 1.3 litre saloon car compared to the 2.0 litre Ghia version I got with my Sound Guys. Oh, they had better mics! No, I bought the same they used, and they used mine. ECM-77, Sennheiser 416, Sanken COS-11, Sanken CS-1 – it’s a role call of industry standard mics. I moved to DSLR and dual system sound, started using a Zoom H4n for my audio, and tried upping the sample rate from 48 KHz to 96 KHz. I’d like to tell you that I did hear a difference, but have been told in no uncertain terms that it was a placebo effect. I thought 96KHz samples sounded more airy and full of the audio equivalents of ‘Volatile Organic Compounds’ or whatever gets emitted when you peel an orange or use some truffle oil – whatever the audio equivalent was, I could hear it but couldn’t convince my peer group that it was there. So I tried using 24 bit over 16 bit. Now, there I darn well COULD get a difference, but it was dynamic range and that’s boring. if you let your camera meters wiggle up to the two thirds mark on your camera meters (I can hear a bunch of Sound Guys sucking their teeth as I type), any sudden increase in volume (speaker suddenly decides to ‘project’, car goes past) pushes everything into the red zone, audio crunches against the end-stops and it’s game over. You have to set your ‘wiggle’ at that point, because if you go lower, you have to raise levels in post and suddenly you’ve got a nasty hiss that stains your audio recording. At 24 bit, you can be waggling up to the half way mark with plenty of room to catch the loud bits, and the hiss is way back down there to the left, unnoticed by your edit software. All that’s great. Go ahead, fill your boots – audio at 48KHz and at 24 bits for the extra and truly valued dynamic range. But I still didn’t hear what I wanted to hear and knew what these microphones were capable of. So, cue the Pix 220 by Sound Devices – purveyors of some extremely good audio kit. Check the test out, make your mind up BEFORE the movie finishes.